A tipster for AndroidCentral claims his international HTC One got an Android 4.2.2 OTA update prompt whilst in Taiwan, and has some photos to prove it. The 465MB update follows a trend set by HTC where it releases Google's newest and greatest in its homeland first. 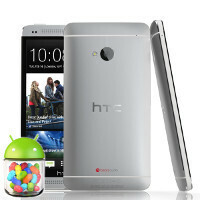 This still isn't, strictly speaking, official, as we have no confirmation from an HTC spokesperson just yet. Some of the more noteworthy changes include the demise of the black bar of horror – the triple dot menu that appears inside of apps is gone as a long press of the back button will be the new menu button. Auto Enhance/Auto Focus enhancements have been added to the camera app, along with a new lock screen widget style and, finally, a battery percentage in the status bar (we hate this oversight!). For the full list of what we know so far, head for the gallery below. Feeling the joy? Us, too. Let us just hope carriers have a hassle-free roll out, and lets show some love to our less fortunate One S-carrying friends. The same as any other 4.2.2 update. Lockscreen widgets, quick toggles, Photosphere (maybe), etc. I have the same opinion whit you. Please htc, include this in the next update and this phone will be perfect! No thank you. My phone works fine.